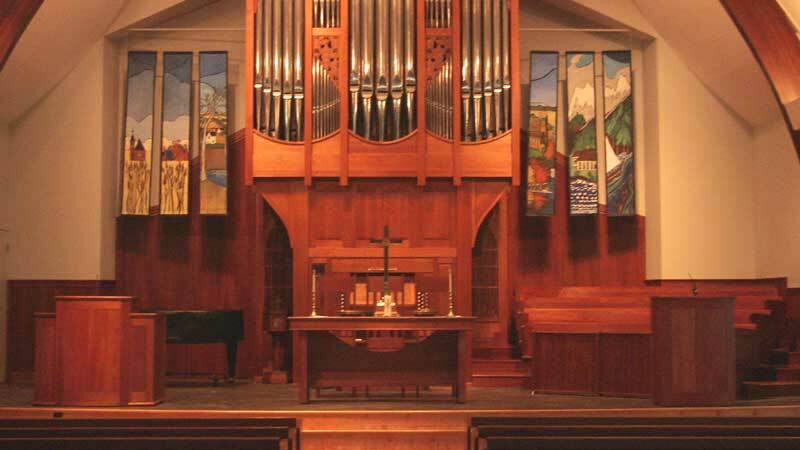 Worship at West Vancouver United Church is an inter-generational and inclusive expression of faith. If you are a visitor or newcomer to our church, please click the Welcome Info button to left for more information. Elements of traditional liturgy, contemporary theology, and an extensive musical repertoire create an inspirational balance that can open the heart to God's mystery and grace. A dynamic youth and children's ministry is a vital part of worship at our Church. The sacrament of Holy Communion is celebrated at an open table. Baptisms are performed within Worship Services throughout the year. Ash Wednesday, Tenebrae, Good Friday and three extra services on Christmas Eve are some of the extraordinary Worship celebrations at our Church. The most recent renovation to the Sanctuary, completed in 1997, was designed to acoustically and visually enhance the worship environment. The stained glass windows in the Sanctuary were designed by Stuart Browning and in the chapel by Richard Babcock. Oikoumene, the boat which hangs in the Sanctuary, reminds us to take our faith out into the world. Flowers are placed in the Sanctuary by volunteers and are often donated in memory of loved ones. The Flower Committee seasonally decorates the Sanctuary and prepares the flowers to be delivered to those in need in our community after the Sunday Services.